Is Ghost Really a WordPress Killer? In the meantime, let’s consider what the latest iteration of Ghost has to offer. It’s a cleaner, faster, more sophisticated Ghost all round. Lets see some of Ghost’s major changes in this new version. Let’s look at the new features. You can now create static pages (About, Contact, etc) easily in Ghost. There isn’t a new screen to create pages, however. You just click the “New Post” link from the top menu, give your post a title (e.g “About Us”), and write the content of the post. Before hitting the “Publish” button, select the “Static Page” check box from the “Post Settings” menu, and this will remove your page from your post feed. You can now mark your posts as “featured”. You can style Featured posts within your theme if you want. To set a post as “featured”, go to the Content section, where you can see all posts with a live preview and click on the star icon to set your desired post as “featured”. When Ghost is loading content, a little blue bar crawls across the screen to let you know, as shown in the image below. Ghost makes it really simple to edit any post. Just type edit at the end of any post’s URL and hit enter, and this will bring you to the post editing screen where you can start editing the selected post. Ghost now supports a date-based permanlink structure. This can be enabled from the general settings menu. Click on “Settings” from the header toolbar, then select “Dated Permalinks”. And that’s not all. You can read the Ghost 0.4 – Aton Release notes to check out all the new features and bug fixes. As mentioned, Ghost 0.4 has introduced an automatic update check service to let you know when a new version of Ghost is available. If you prefer, you can disable this service with a flag in config.js at any time. 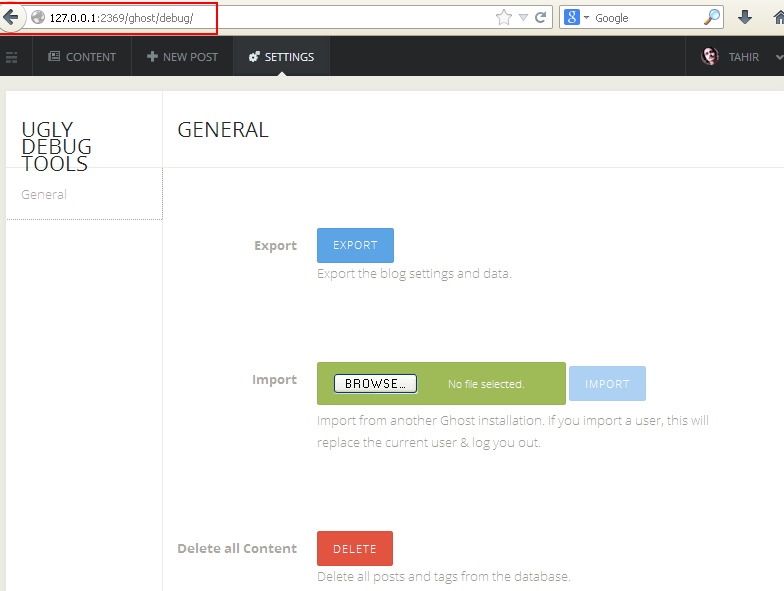 If you are using Ghost’s hosting platform, your blog will be automatically updated. If you are running Ghost on your own servers, you will need to download Ghost 0.4 and then read the Ghost Upgrade Documentation to learn how to upgrade. And of course, it is highly recommended that you make a back up before upgrading. To back up your database, log in to your Ghost blog and go to http://your-blog/ghost/debug/ and you will see following screen. Ghost has a lot of similarities to WordPress, but it’s worth checking out if you are looking for something with a greater focus on publishing and simplicity. If you’ve tried Ghost or have examined some of these new features, we’d love to hear what you have to say.